Emails are a powerful method of communication with the ability to send messages and files around the world almost immediately, free of charge. Being able to send and receive emails on your device within your eVB, VB.NET or C# application allows you to communicate with the largest audience, whether it is a sales manager back in the office or a customer. The Sapphire Mail Utility has been designed to work with the device’s built in mail box features to allow you to configure the mail box and compose new messages. You can also receive messages from the mail box. 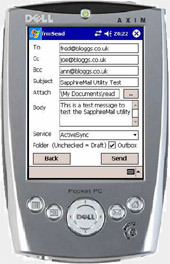 This allows a user continue to manage their emails through the application or via the Pocket PC Inbox application. Implementation couldn’t be easier, simply declare the DLL function as a function within your application and call it as though you wrote it yourself. Here’s a sample demo to show how to create and read emails within VB.NET.